Before you can use an email address as a "from address" in marketing emails, you must verify that the email address belongs to you or your company, or that you have access to it. Please note: as of January 30, 2019, Marketing Hub Basic, Professional and Enterprise accounts will be required to have all from addresses verified for all new and existing emails. Users in these accounts can verify email addresses in advance of this date to prepare for this requirement. If you have a connected email sending domain, all existing and new from addresses at that domain are automatically verified. For example, if you have a connected email sending domain for domain.com, new and existing email address such as john@domain.com or info@domain.com are automatically verified. The email addresses of all active and confirmed users in an account are also automatically verified. Click the name of a draft email or click Create email. In the content editor, click the Settings tab. Click the From address dropdown menu and select an existing or add a new email address. In the upper right of the content editor, click edit Edit details. Click the From address dropdown menu and select an email address, or click Add/Manage and add a new from address. In the dialog box, click Send verification email. 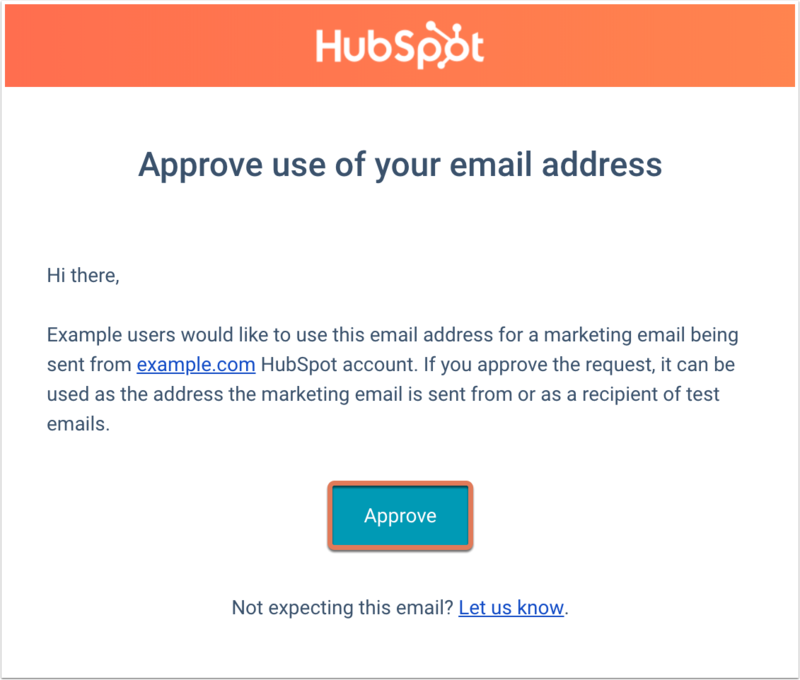 You'll receive an email asking to approve use of your email address in marketing emails sent from your HubSpot account. Click Approve. The email address will be immediately eligible for use as a from address or test recipient of marketing emails in your HubSpot account.